It took a last-minute touchdown but, for the second time in three years, Stoneham is a sectional champ. Sectional Final weekend is officially in the books. While six teams – Everett, Xaverian, Lincoln-Sudbury, King Philip, Nashoba, and Littleton – sealed Super Bowl berths, 10 others will now battle it out in the state semifinals, hoping to join them at Gillette Stadium. The Crimson Tide all season long have been considered the top team in Massachusetts, and Saturday’s performance against Central Catholic in the Division 1 North Sectional Final did little to change that notion. Xaverian, meanwhile, overcame a 3-3 regular season to rally back and win their fifth consecutive Division 1 South Sectional title in dominating fashion over Catholic Memorial. Elsewhere, North Attleboro easily took care of business against Duxbury to clinch a spot in the Division 3 State Semifinal, where the Red Rocketeers will take on Tewskbury. St. John’s (Shrewsbury) defeated rival Shrewsbury 34-16, Cathedral ended Lynn Tech’s undefeated season, and St. Mary’s (Lynn) and Millis cruised to sectional final wins. There is still plenty of excitement to come over the next two weeks, including state semifinal action next weekend, the Gridiron series at Fenway Park, and Thanksgiving Day rivalry games. Before we look ahead to those story lines, lets take a quick look back at sectional final weekend. Those who attended the Division 6 North Sectional Final between No. 1 Hamilton-Wenham and No. 2 Stoneham almost certainly expected to see an offensive shoot out. To the surprise of many, however, that turned out not to be the case, as it was a late methodical drive by the Spartans that delivered them the sectional championship. After seeing Hamilton-Wenham score 18 unanswered points over a 10 minute span in the second half to take an 18-14 lead, Stoneham got the ball back on their own 37-yard line with just over six minutes remaining. Star running back Tre Pignone (140 yards, TD) spearheaded a 12-play, 62-yard drive that was capped off by a Christos Argyropoulos one-yard touchdown run to give Stoneham a 20-18 victory. 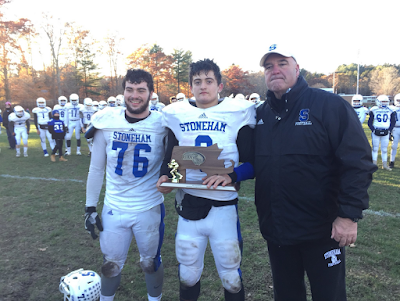 Stoneham’s triple option offense kept the Generals off balance for most of the afternoon. While there were no “quick strikes,” the Spartans’ drives were deliberate, time consuming, and productive. Pignone, Argyropoulos, and Kevin McShane highlighted a rush attack that totaled 270 yards on the ground, as well as all three Stoneham scores. The sectional championship for Stoneham is their second in three years. Late Friday night it looked as though, for a third consecutive year, Watertown would fall short in the sectional final. After Leo Quinn ran for an 18-yard touchdown, No. 1 Lynnfield held a 34-24 lead with just 2:55 to play. Over the final ninety seconds of play, however, nothing short of a miracle propelled the Raiders to the Division 5 North Sectional title. First, quarterback Nick McDermott (3 TD passes) hit senior wide receiver John Korte for a five-yard touchdown to pull Watertown to within 34-31 with 1:15 to play. The Raiders proceeded to recover the onside kick and McDermott, now with a chance to give Watertown an improbable victory, led another game winning drive. The senior quarterback moved Watertown inside the Lynnfield 10-yard line with less than 15 seconds to play and, from six yards out, dashed across the goal line to deliver a 38-34 win for the Raiders. Late drama is something the Raiders are quickly becoming accustomed to. Just last week they knocked off Somerville with a game-winning touchdown in the contest’s final 20 seconds. Watertown now moves on to the Division 5 State Semifinals where it will take on Dennis-Yarmouth. One could easily have mistaken Friday night’s Division 2 South Sectional Final between King Philip and Bridgewater-Raynham for last year’s postseason bout. In a near mirror image, Warriors’ running back Shane Frommer stole the show, running for 203 yards and three touchdowns to power King Philip past the Trojans, 29-19. Over the course of the two sectional final meetings between the two, Frommer has run for a combined 396 yards and six touchdowns. The win is not only King Philip’s 23rd in a row, but it advances the Warriors to the Super Bowl where they will take on Division 2 North champion Lincoln-Sudbury. It has been quite the turn around for the Warriors over the last two seasons. After not winning a single state championship in program history, King Philip is on the verge of winning back-to-back titles. King Philip head coach Brian Lee said he was not quite sure to expect coming into this season. -Jake Willcox threw for 308 yards and four touchdowns as Everett defeated Central Catholic, 37-29, to claim the Division 1 North Sectional title. -Melrose won the Division 4 North Sectional Final over Marblehead, 28-20, behind three touchdowns and 245 total yards from Isaac Seide. -St. John’s (Shrewsbury) claimed its first sectional title since 2013 as quarterback Steve Bucciaglia finished 18-of-23 for 204 yards and 2 TDs.